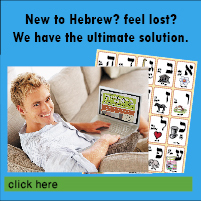 This is a catalogue site of resources for modern Hebrew. The background to this project is here. If you're interested in hearing more about my experience studying Hebrew, click here. I'm still looking for a dictionary of Hebrew words by frequency. So if you know of one, I'd be very grateful if you could send me the details. Hebrew keyboard layouts - how to install, etc. Tourist Israel - "Israel's cool travel guide"